An exterior view of Liberty Wharf is seen from Boston Fish Pier. Liberty Wharf is a remarkable little building, mostly because it’s a little building. 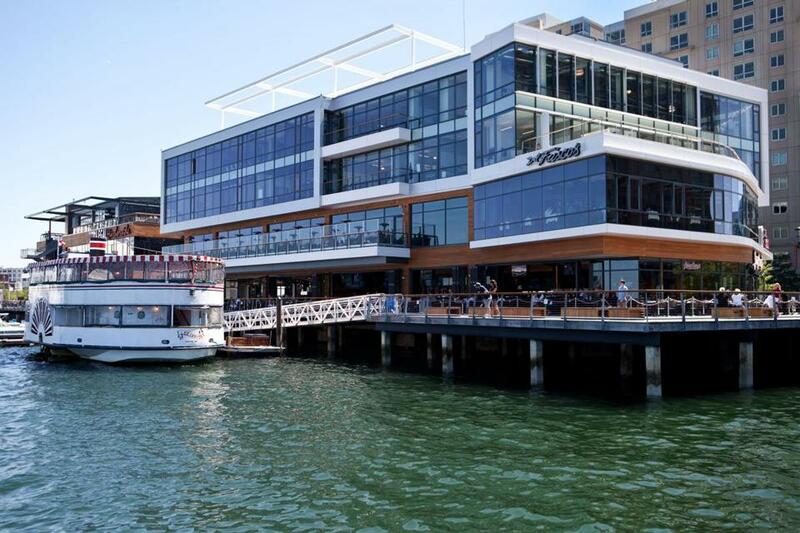 The wharf is just a few restaurants, clad in glass and jutting out over the harbor in South Boston. But it has become an anchor of activity along what was once a forlorn stretch of Northern Avenue. Liberty Wharf has diners flocking to the Seaport, and large-scale redevelopment efforts chasing close behind. It’s an unquestioned success story. And in this success, a group of North End neighbors see a future to fear, and oppose. The developer behind Liberty Wharf is trying to drop a similar project along the Rose Kennedy Greenway in Boston, on a small, triangular sliver of land called Parcel 9. Efforts by the Massachusetts Department of Transportation to unload the parcel now center around the question of making the Greenway look more like the Seaport — a magnet for residents and visitors alike, and ripe for follow-on development efforts. This being Boston, there’s vocal opposition to those selling points. The soap opera at Parcel 9 has dragged on for four years. The effort stumbled into intractable issues like the state’s chronic inability to build housing, the power struggle between the state and the city, and the tenuous relationships old-line institutions like Haymarket’s pushcart vendors maintain with a rapidly changing city. And just when those flare-ups looked to be headed toward amicable stalemates, the fight over Parcel 9 has suddenly become a fight for control of post-Big Dig Boston. The payoff from the Big Dig is bigger than the Greenway, the string of immaculate parks running the length of the old elevated Expressway route. The project allows Boston to create exciting new buildings that embrace the parks and the harbor in compelling ways. Dewey Square and Russia Wharf are new centers of gravity at the old Expressway’s southern end. City planners want to create a similar node around Haymarket Square, with food sellers spilling from the current Haymarket pushcart operation ointo Parcel 9, and into a new, locally focused public market next door, at Parcel 7. The market district would span all price points, and it would tie Quincy Market to the North End and the burgeoning Bulfinch Triangle neighborhood. Both the developers vying for Parcel 9 include market space at the ground level. The controversy starts at the second floor. The state is currently deciding between a bid to top a market with a hotel, and one that would add three restaurants and 70 apartments. The development now turns on opposition to the Liberty Wharf developer’s restaurant proposal. The vast majority of a citizen panel advising MassDOT on the parcel’s redevelopment back the apartment and restaurant proposal. But recently, a group of North End residents have lined up behind the hotel. This is not out of any affinity for its design or use, but out of opposition to the alternative: They can’t stand the idea of another Liberty Wharf opening up on the Greenway. Their opposition isn’t isolated. Last year, a North End civic group said it would oppose any new liquor license applications in the neighborhood. Never mind that reflexive opposition to any incremental increase in having fun after dark plays to Boston’s worst Puritan stereotypes. This is about crossing over the buried Central Artery and trying to get the Greenway to play by rules North Enders just invented. The essential complaint about the housing and restaurant proposal is, if it’s built, it will draw people to the Greenway. Is that such a bad thing? New restaurants would surely bring visitors who would eat and drink and converse, sometimes with the windows open, and who might spill out into the Greenway parks afterward. The North Enders who are afraid of this see the Greenway not as an outdoor living room, but as a museum with trees — a place to observe from a distance, with minimal exuberance. Parcel 9 belongs as much to Quincy Market, Bulfinch Triangle, and Beacon Hill as it belongs to the North End. The future residents of the buildings that will replace the hulking Government Center Garage have as much riding on a good development at Parcel 9 as current North Enders do. That’s why the citizen panel advising MassDOT, with the exception of its North End contingent, has lined up so strongly in favor of housing and restaurants and robust activity. The question for the state is whether it treats the Greenway as a network of parks that belong to everyone, or as a stretch of private front lawns for Boston’s more vocal neighborhoods.